Product #2359 | SKU BEDR600 | 0.0 (no ratings yet) Thanks for your rating! You wouldn’t think of using anything less than best reverb you could get in the studio. So why skimp on the ‘verb at your live gig? 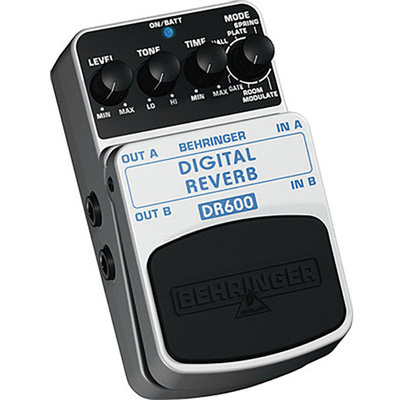 Now you can add studio-grade reverb to any amp with the mind-blowing DIGITAL REVERB DR600. This 24-bit, high-resolution collection packs six (6) of the most desired reverb types—SPRING, PLATE, HALL, ROOM, GATE and MODULATE, into the ultimate “to-go” package. With its dual output jacks, you will dazzle your audience with true stereo reverb. Just select the reverb type with the MODE control, and then dial in the LEVEL, TONE and TIME. It just doesn’t get any easier than this. The blue LED tells you when the DR600 is activated, and the top-quality on/off switch maintains incredible signal integrity when in bypass mode. You can power the DR600 with a 9 V battery or our PSU-SB DC power supply (not included).